House fires can travel in seconds, and prove devastating. When it comes to fire safety, preparedness is key. 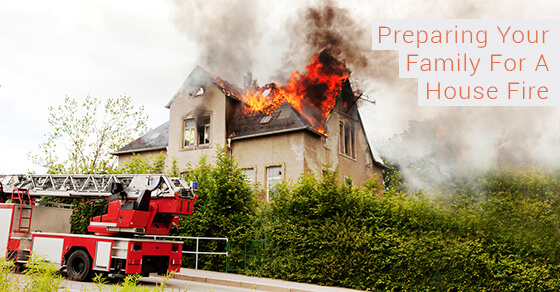 If a fire should occur, you and/or your family members may panic. If you have clear fire safety steps in place, it will be easier for everyone to remember exactly what to do. Practice and preparedness can combat panic and increase everyone’s chances of safety. Create a fire escape plan: Create escape plans for every room of the house, including the basement and attic, including a meeting place outside (far enough out of harm’s way). Create a written version of the plan you can post on the fridge, or bulletin board, and make sure everyone is acquainted with the plan. Practice the plan once or twice a year. Install smoke alarms on every floor. Since a high percentage of house fires begin in the kitchen, it is recommended that you place an alarm close to the kitchen. You should however, avoid placing an alarm in the kitchen as it may be set off by regular cooking, which will prove a nuisance and may also desensitize your family to the alarm. Check and replace alarm batteries regularly. Make sure oven, stove, and other appliances are turned off before leaving the kitchen, or the house. Be careful with leaving flammable items too close to heat sources, such as space heaters. Educate your children about fire early; teach them not to play with matches, lighters, candles and teach them what to do in case of a fire. Remember: even though you try your best to keep fire starting devices out of reach of your children, kids have a way of getting into things they shouldn’t. Teach your children that such items are not for them, but also teach them what to do should they burn themselves, or start a fire. Make sure everyone knows how to call 9-1-1 and how to report a fire. As much as you educate your family, and prepare them in case of a fire, it’s important to give yourself and them the advantage of fire alarm monitoring. Fire monitoring can save precious moments in case of a house fire by alerting emergency services as soon as an alarm is triggered. Contact us today with any more questions about fire alarm monitoring, or any other home security needs.